Four years ago, I heard the Fields of Athenry for the first time during the European football championship in Poland and the Ukraine. Accompanied by rhythmical clapping the refrain always starts again. It is like the never-ending surf of the sea. The Irish cheer for their team and appreciate at the same time the performance of their opponent who is the current world champion. I don’t know how often I watched different videos of this unforgettable night on YouTube. Besides the the short and compact version from above there are numerous versions that are longer and filmed from different angles. A few examples can be found here, here and here. The Fields of Athenry was written in the mid-1970s by Pete St. John. Recorded and released for the first time by Danny Doyle, it entered the top ten of the Irish single charts straight away. One of the most popular versions is the one from Paddy Reilly. It was release in 1983 and stayed in the charts for 72 weeks. The song is set in Athenry in County Galway during the time of the Great Famine in Ireland during the 1840s. It tells the story of a young man called Michael who is caught stealing corn to feed his family. His punishment is to be deported to Australia. His wife has to stay and raise the child on her own. The chorus describes the young couple’s love in the days before the famine. The lyrics of the song are really heart-breaking especially when you bear in mind that this story is not an individual case. One very nice live version of this song is the one from Paddy Reilly and The Dubliners. You can tell how well this song os suited for singing along with it. The Fields of Athenry was adapted by the Irish football fans, the so-called Green Army, during the worldcup of 1990 and also taken over later by the fans of Celtic Glasgow. Today, it is used by a lot of fans of Irish sports teams. There also is a special version sung by the fans of FC Liverpool. Consequently, it is called The Fields of Anfield Road and has its own lyrics. And also during the UEFA EURO 2016 a new version was created. It was sung by three men from Drogheda in the train station of Valenciennes. Brian Connolly used the piano there and created a unique interpretation together with his brother Des and Sean Maguire of The Fields of Athenry. It was only a few hours before the noteworthy victory over Italy. Unfortunately, it was Ireland’s last victory in the tournament. 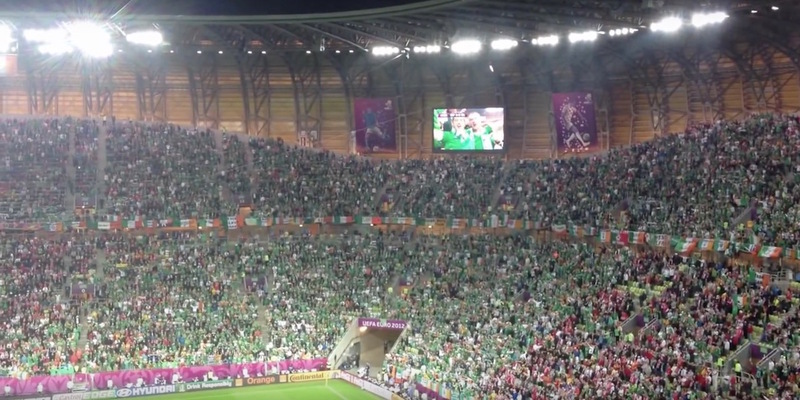 But it seems that the Irish fans always enjoy their time no matter if they win or if they lose. Their singing and activities were legendary and gave people all over the world smiles and laughs. If you have missed it, you can check out a few examples here. It didn’t come as a surprise for me that the Irish fans received the Medal of the City of Paris for their sportsmanship. This was so well deserved! Thank you to all Irish supporters! I can’t wait to see and hear you again in the next tournament.